Ben's Whisky Blog: SMWS–Joe’s retirement tasting! Joe McGirr has been with the SMWS for almost exactly 10 years. He’s had a number of roles including the renovation of Queen Street, and for the last four years he’s been manager at Greville Street in London. He and Tom Thomson really introduced me to the society – Tom sent me my first tastes and got me interested, and Joe made sure I got hooked and became a member. At the start of August he’ll be leaving (to join the London Distillery company as Chief Operating Officer) and this tasting, at the sign of the don restaurant in Bank, was his last with the SMWS. We had the tasting in the sign of the don restaurant and bistro, which is a really cool place, going down many levels through cellars that once held all maturing Sandeman port in the UK. We tasted the 2nd, 3rd and 4th whiskies in the lowest cellar (actually a tunnel), not usually open to members of the public due to the extremely steep stairs. This tunnel was used for transporting casks directly from the Thames to the main cellars (now dining rooms in the restaurant) when the Thames was closer to the city than it apparently is now. 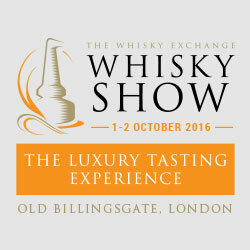 An excellent venue to taste some serious whiskies! I was extremely lucky to have been invited to this tasting. I’m really sad to see Joe leave, but the London Distillery company is a very cool thing and it’s an amazing job to land in London. Cheers Joe and good luck! We had this on the rocks! In a tumbler with lots of ice, it stood up well with the ice and glass pushing down a lot of the flavour and nose and leaving behind firm wood and good structure. A lovely, refreshing opening to the evening. Nose - Sweet, hard icing, deep furniture polish, acrylic paint on new furniture. A little Bassett's liquorice allsorts, then deep boiled sweets. Real balance with the wax, good quality wood influence in a young whisky, and a rather good nose overall - lots of balance and complexity. Body - Sweet but intense liquorice and star anise. Intense wood sourness. Finish - Medium but with a sharp drop into bitterness, very numbing. With water, more fruit - blackcurrant and passion fruit. Nose - Intense Christmas cake, massive with toasted malt loaf. Darkly, sweetly smokey. Sweet soaked raisin and burnt butter, absolutely epic. Body - Rich, rich raisins and buttery cake. Finish - Extremely long, intensely darkly wooded but so progressive. Leather notes at the end. Nose - Enormous, enormous intensity. UHU glue, bourbony raisins, incredible sweetness, demerara sugar, petrol, plastic cement, prunes, musky wood and intensely fruity. Body - Old wood, blackened oak panelling, insane dark fruit, perfect balance and enormous intensity. Finish - Infinite, tons of balanced sherry sweetness. Continuously changing, enormous and endlessly fascinating. With water, more oily sherry comes through, and a little of the Springbank characteristics I like. With more, more old leather. Just fabulous whisky, I’m on the hunt for this now. This was brought along by Phil Storry, and is interesting to me not only because the whisky is now illegal (the SWA banned the use of Coffey stills in the production of Scotch Whisky) but also because I’d never heard of the distillery, being yet another output of Loch Lomond distillery. Nose - Softely peated, rich cereal, breadcrumbs and malted bread. Light citrus, limoncello, sour pears and green apples. Vanilla. Quite lovely. Body - Quite intense (with Islay character), but then smoothly into sweetness (toasted bread and honey). And still earthy. Finish - Medium, toasted, lots of malt, musky and quite lush. Quite a plasticky feel to it, but balanced and with quite intense peat. I’ve been through (after sharing it out) most of my bottle of this and still not got round to making proper notes. It was too late and too many whiskies to make proper notes this time, we were eating, and I was having too much fun! Nose - Sweet sherry, dry and beautiful. Intensely meaty (although I was eating steak at this point, I don’t hold with this whisky and food pairing) and very balanced. Body - Beautiful, sherry. Finish - Strays into bitterness. I’ll get to posting a proper review of this (now famous) SMWS Glenlivet very soon. I was really looking forward to this one, as I’ve only tried one SMWS Ardbeg and love it (review soon). However, I was a bit plastered at this point – as I’ve said before it’s a real shame to leave the peated drams to the very end. I’ll try and get hold of another dram of this for a proper review at some point. Nose - Rich, bright, sour oaked peat and lemon. Piney and beautifully balanced, intense and fresh. Body - Sweet and sour peat, lemon, oak, clear and clean. Finish - Medium, balanced peat.